… This is NOT a northeast dish. :)) — but it is a typical northeast Chinese sauce for fish. — Am I making sense? In China, well, at least in northeast, salmon is quite rare. So, there are not many typical Northern Chinese dishes with salmon. Probably, when talking about Chinese fish recipes I already said that in North East China, the fish is normally relatively small, just long enough to fit into a rectangle (or oval) shaped fish plate, and normally presented on the table with head and tail. And it is normally white fish, I only started having salmon since I came to Europe. I never really liked big fish, I think they give me a ‘meaty’ feeling, but then I began to love salmon, smoked salmon, salmon cake, salmon fillet… you name it. 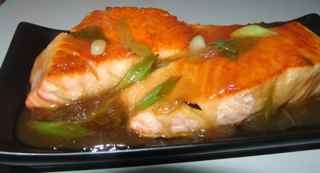 (Salmon in Chinese is pronounced as “san wen yu”, as three patterns fish.) I did not really know how to cook salmon apart from simply grill it with salt (which is really nice already). I also tried Chinese way — a very popular way of cooking called jiao zhi, means to pour the sauce on the top. But this time, I am ‘lost in translation’, don’t know what is the best way to translate it into English. Normally, food is cooked first without any seasonings, then the sauce is made separately and finally poured on top of the already ‘cooked’ food. In my previous recipes, ‘tofu with sesame sauce’ I already gave an example of this. Anyway, so if you are a big fan of salmon like me, this is a ‘teriyaki’ treat. If you like this sauce, it can go with many different kinds of fish, and by altering the amount and proportion of the sugar and vinegar, you can create slightly different sauce for different kinds of fish. Here you go, my ‘jiao zhi san wen yu’. Oil, white sugar, rice vinegar, light soy sauce, spring onion, ginger, garlic (optional), salt, cooking wine, corn flour. 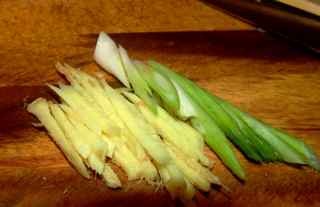 1) Chop 1/2 of the spring onion and a small piece of ginger into slices. 2) Mix around 1 teaspoon of corn flour with 3 tablespoons of water, 1 teaspoon of sugar, 2 teaspoons of vinegar, 1 tablespoon of light soy sauce, 1/2 teaspoon of salt. Stir well. 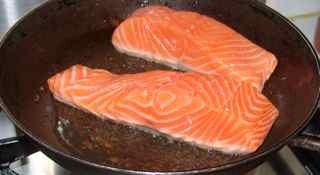 1) In a heated flat sauce pan, pour in around 3 tablespoons of oil, when the oil is hot, place the salmon fillets in the sauce pan, keep the fire medium to low. 2) Turn over the salmon fillets time to time, get both side done. When it is done, remove it to a plate. 3) Place a wok on the fire, pour in around 1 tablespoon of oil. 4) When the oil is hot enough, put prepared ginger and spring onion sliced into the wok, and 1 teaspoon of cooking wine. 5) When the smell of the ginger and spring onion rising up from the wok, put the corn flour mix into the wok — be careful, there might be some hot spills. 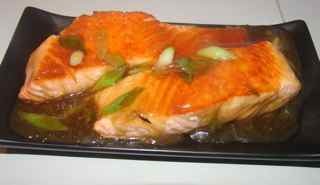 6) When the sauce in the wok is bubbling, turn off the fire, take the wok, pour the sauce over prepared salmon fillets. Easy, no? :)) And it does look like ‘salmon teriyaki’ a little bit, no? I like to have it with boiled rice.